Crab cioppino from Sotto Mare. The crab is quartered and you must use utensils to get at it. The other night I had the best cioppino I have ever had. I’ve had variations of this wonderful tomato-based seafood stew all over the world (including the legendary bouillabaisse in Marseilles) but I left my heart with the Dungeness crab cioppino served at Sotto Mare Oysteria and Seafood restaurant in North Beach, San Francisco. It makes sense, since cioppino was invented by Genoan fishermen from the SF Bay Area in the 19th century who threw together the freshest catch from their day at sea. It involves a lot of shellfish: calamari, shrimp, scallop, clams, mussels, crabs and I think a large part of what made it so good was the freshness of the shellfish obtained from the nearby Pacific Ocean. Shellfish contain a lot of cholesterol and many of my patients have been told to minimize or avoid shellfish, especially shrimp, due to concerns they will exceed the (completely arbitrary) 300 mg daily limit suggested by the American Heart Association and the USDA nutritional guidelines. But there are definitely warnings out there on the internet and traditional new media from seemingly responsible authorities. Other publications advise those with high cholesterol or higher risk of heart disease to choose low-cholesterol varieties of shellfish over shrimp. Let’s look at what is actually known about consuming shrimp and shellfish. A study of over 13,000 subjects (the ARIC study) found no increased risk of cardiovascular disease in the high shellfish consumers versus the low shellfish consumers. 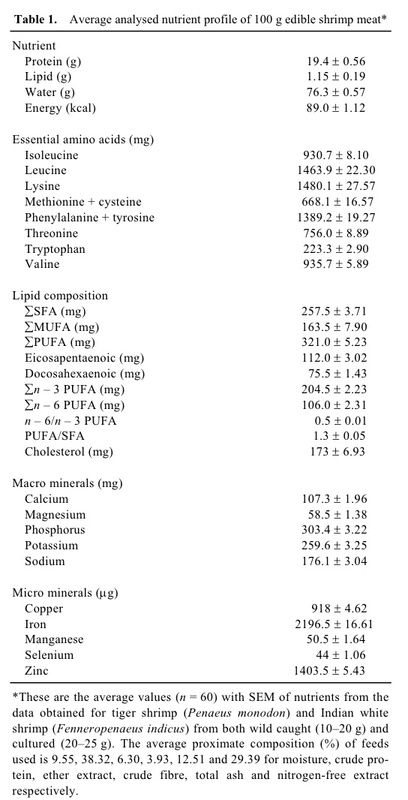 A study in 1996 compared consuming a diet with 300 grams (about 10 oz.) of steamed shrimp/day (providing 590 mg of cholesterol daily) versus a baseline diet of 107 mg/ cholesterol in 18 individuals without cholesterol problems. The shrimp consumers compared to baseline had a 7% higher LDL or bad cholesterol but a 12% higher HDL or good cholesterol. Thus, the ratio of total to good cholesterol went down. We now know that this ratio is a much more important risk marker for cardiovascular disease than the total cholesterol. Triglycerides dropped significantly when subjects were consuming shrimp versus the baseline, low cholesterol diet. A 1990 study looked at multiple different types of shellfish substituted for meat, cheese and eggs, and found that oyster, clam, crab and mussel diets (with lower cholesterol and higher omega-3 fatty acid profiles) lowered VLDL triglycerides and VLDL cholesterol. These shellfish diets, except for the mussel diet, also lowered LDL and total cholesterol. Shrimp and squid had no effect on the lipid profiles. I’ve focused on shrimp in this post because it has the highest cholesterol content of all shellfish and therefore is the most likely to be considered bad for heart patients or patients with high cholesterol. I’m presuming if I can convince you that shrimp are heart healthy, then you will believe that all shellfish are. Take a look at this chart of the nutrient composition of shrimp and you can understand that, once you eliminate unsubstantiated fears of the cholesterol content, this a great food. I am not a big advocate of examining the macronutrient composition of foods in order to predict their health benefits. This approach to nutritional science resulted in the development of highly processed low-fat monstrosities that currently sit in boxes and bags and line the most prominent parts of supermarket shelves. The overall effect of foods on the cardiovascular system depends on an incredibly complicated interaction of food components, bacteria in the gut and genetic predispositions: areas we are only beginning to understand. However, for those readers who are concerned about such things there is reassurance. Start with the fact that there are no carbohydrates in shellfish: since carbs and added sugar are likely the biggest culprits in our obesity epidemic, shrimp and shellfish are great tools in helping to manage weight. Shrimp have a very high percentage and quality of protein content for muscle building. Some avid shrimp promoters insist that shrimp should be consumed regularly to reduce the risk of both cancer and heart disease. The fat in shrimp is mostly polyunsaturated fat with a high ratio of omega-3 to omega-6 which is considered optimal . Eating 100 ounces of shrimp daily gives you 180 mg of EPA and DHA (considered the most important of the omega-3 fish oils for heart health) daily, close to the 250 mg daily the USDA recommends for most adults. Astaxanthin has been found to be a potent natural antioxidant, exceeding ten times the antioxidant activity of β-carotene and 500 times that of α-tocopherol. The astaxanthin level of wild shrimps has been reported to vary between 740 and 1400 μg/100 g in edible meat portions. If I were a vegan or vegetarian I would consider slipping shrimp into my dishes instead of tofu. The cioppino recipe above doesn’t add a lot to the shellfish and fish: a little olive oil and tomatoes, basil and garlic-these things are not going to jack up the calories, sugar or fat content. Depending on how you cook shrimp, the resulting dish will have markedly different nutrient composition compared to the raw nutrients listed above. Breading and deep frying the shrimp takes 3 oz from 60 calories to 206 and the fat grams from 1 to 10. I suspect that you or your body will figure this out and eat less later. Given the fairly low fat and carbohydrate content of the Sotto Mare cioppino, I am ashamed to admit, I ate that whole bowl pictured above (which the menu said could be shared between two). The SOSC doesn’t share my love of cioppino; she ordered the linguine with clam sauce. Three ounces of clams have only 26 mg of cholesterol but it seems to me the majority of calories in this dish are coming from the carbs in the pasta and whatever the composition of the sauce is. In any event, the SOSC pronounced it the best she has ever had. The level of mercury is a concern in all the fish that we consume. Fortunately a recent study from Maine University found that shrimp is very low in mercury. This included varieties from Thai shrimp farms, Maine shrimp farms and the Gulf of Mexico. In comparison to other types of fish, shellfish are universally on the low end of the mercury level graph as shown below. 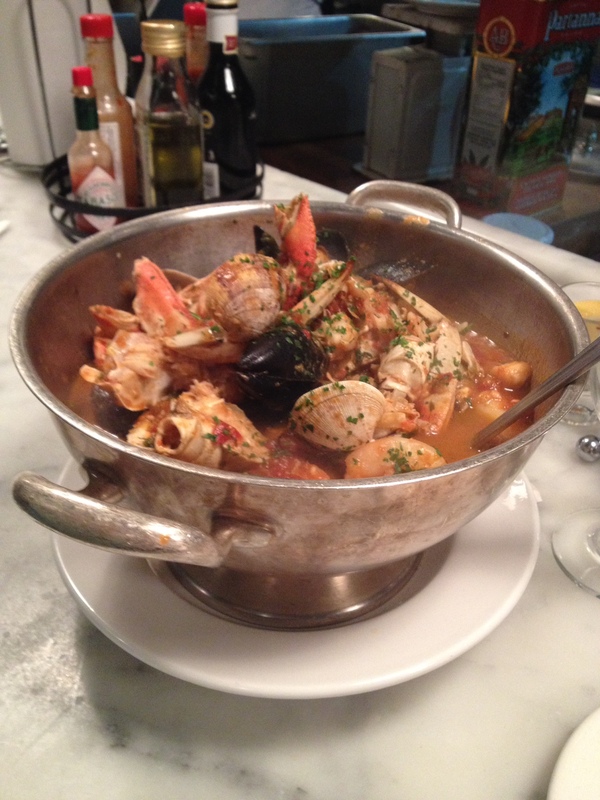 Fear neither the cholesterol nor the mercury in shrimp and consume your cioppino with gusto and without guilt! Another fabulous post from my friend and hero! Great post! I’m actually eating shrimp right now. Now AMA says none of this is true! So today my doctor told me my Cholesterol was too high and I should be avoiding shellfish, eggs, butter, all animal fats, and high fat dairy. She told me to use margarine! I’ve been doing Keto (mostly just avoiding sugar and white processed food) for about two months and all I could think as she was talking was “sugar, sugar, and fake fat”. What diet do you recommend to your patients to naturally reduce cholesterol? I saw your recommendation to eat Mediterranean. Will that reduce? I pretty much feel like I already eat that way.